Paradox fell up against the canvas. “Horse nuggets!” He grumbled. Yeah, that was a mess.” Silver started to giggle. “I think we’re going to have a boy.” She murmured as she lay on her side to look at him. “You have a boy name in mind?” He asked. “Yes.” Lilly nodded then made a face as she felt a slight contraction. A week later Twilight had just left the room where Celestia was being kept. She didn’t awaken the whole time Twilight had been with her. Twilight saw that the day was coming to an end as she walked down the hallway of Canterlot castle. She felt that everything she had tried to make Celestia better had failed. She was about to walk out the nearest door to the courtyard when she saw Discord walk from the throne room and down the hall. She decided to follow him. 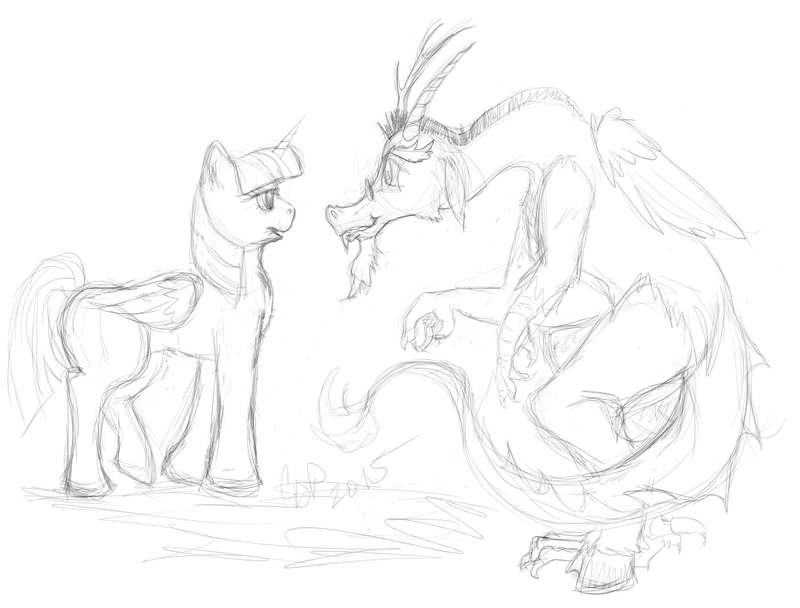 Discord’s ear perked up when he heard Twilight following him. He chose to ignore her and opened a door to the side and went in. Twilight moved her head away. “I… Why are we in your library?” She asked back. Twilight looked at him. “I… I shouldn’t have to explain myself to you.” She huffed. “Whatever Twilight.” He started to pull books from random shelves of his library with his magic. “I think anything you need answers to are in here.” He piled the books in front of her. “Now if you will excuse me; I have to check on my pregnant wife.” He disappeared leaving her alone. “I didn’t want to look through your library!” She shouted. Twilight stared at the books hoping one would just present itself to her. She lifted one up and started to page through it. She never read this book before and wondered what other books were in Discord’s library that had never been seen by any pony. She frowned as she read some of the chapter of the book she opened. Some of the best cures have been developed through natural means. If anyone is to have suffered a mental breakdown, be sure to get a lot of sunshine, and consult a zebra. “What? Consult a zebra? Why?” She read through the book more as her eyes started to widen. “Why isn’t this book in my library?” She closed it and looked at the title. “Cures for the Mind and Soul. 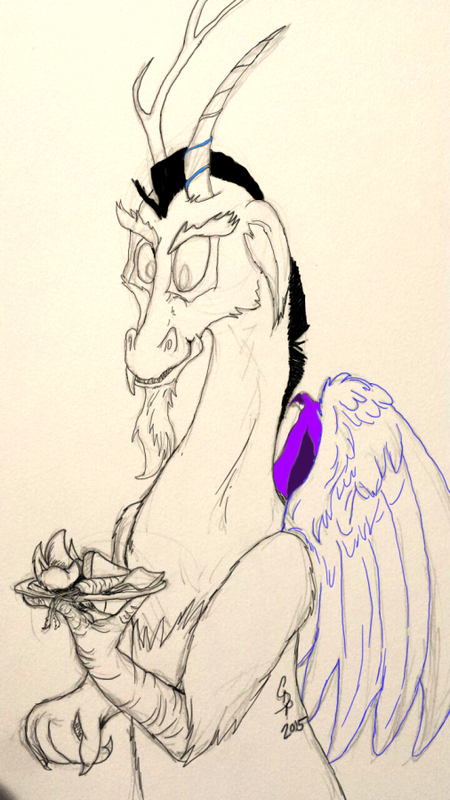 Written by Star Swirl the Bearded.” Twilight gasped as she opened the book again and saw that it was even signed by him. It was inscribed: To my associate Discord hopefully you don’t cause too much chaos while I am away. –Star Swirl. Twilight was in total shock as she started to read the book more. Paradox and Silver appeared next to a bench that was along a trail in White Tail Woods. On the bench was a piece of paper held down with a rock. Paradox walked to the bench and set Silver down on the bench. Silver moved the rock and looked at the piece of paper. She unfolded it. “It says: ‘Say the magic word, trot twenty spaces to the left of the bench and find another piece of paper’.” Silver said as she read the note. She opened the paper and there was a word written on it. “Revlis.” She said it out loud. Silver spread her wings and flew to Luna Falls and looked around and saw a large rock next to the falls in the middle of the lake. She landed and saw a piece of paper with a red rose on top of it. She gently moved the rose off it and opened the piece of paper. She blinked at the words and tried to figure out how to say them out loud. “Emyrramuoylliw Revlis.” She managed to say. Silver blinked at Paradox in shock. “Will I what?” She asked. 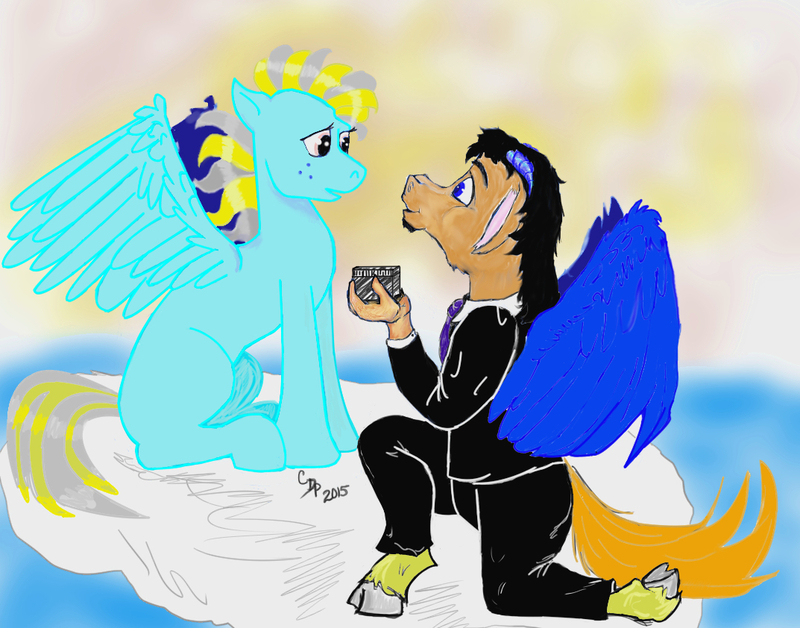 He grinned as he gently grabbed the piece of paper from under her hoof. “Read it backwards.” He said as he held it up to her to read again. Silver looked at the words. “Revlis is my name.” She smiled. 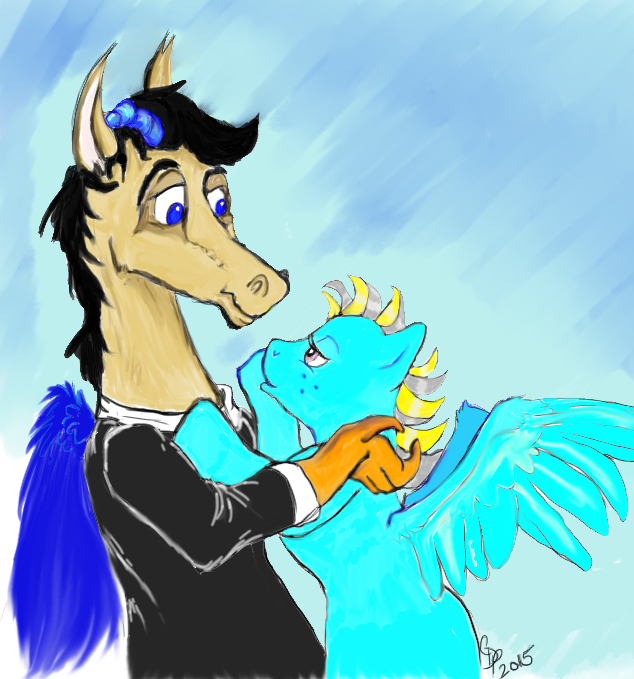 “Let me see, Oh…” she suddenly shuffled her hooves as she looked at him; her eyes filling with tears. “Oh… Doxy…” She breathed out. Silver smiled as tears ran down her face. “Yes, of course I will. I love you Doxy.” She leapt at him, he was taken by surprise; he snapped the box shut as she tackled him and they both fell into the water that surrounded them. He held her tightly as they kissed each other passionately. “So what is this party about?” Silver Dash asked as she placed her helmet next to a box of odd paints and brushes that Paradox had just left on a table. His room overlooked a lot of wonderful landscapes. Since he had recovered from his depression he had been a lot more creative. Silver though seemed to be the only one to have seen a lot of his creations and she had told him that he should show some of the paintings and drawings he had done to his family. He was adamant in the fact that his family wouldn’t understand his ambition and Silver knew that was just an excuse. Paradox’s eyes widened as he saw her walk further into the room. “Silver, can you please wait over there?” He said vaguely. “Oh, sure Doxy? Can you elaborate more?” She looked behind her and she stepped back until she was near the opposite wall. “Nope, I don’t think so.” He snickered as he kept hidden. “Cake does sound delicious.” Paradox replied as he slowly stepped out from his hiding place. Silver blinked at him. He was dressed up really nice, wearing a suit with a tie. She blinked several times. “Why are you dressed up? Not that I am complaining, since I don’t see you dressed like that often. This is Sprinkle Icing’s party we are going to, and she usually doesn’t have fancy dress up parties.” Silver Dash admired him. “Actually, I wasn’t planning on going to Sprinkle Icing’s right away.” He smirked as he put his paw through his mane. “I thought that we’d go take a walk through Whitetail Woods for a while. “Once you and I get there, we’ll be there.” He replied. “I know that.” He picked her up and nuzzled her neck as they disappeared.